We’ve Finished our RTW, so What Were Our Favorite… Ruined Cities?! We’ve finished our RTW trip. We get a lot of questions about our favorite things on the trip. We’ve decided to start a new series called “So, What Was Our Favorite…” We visited 29 countries on our RTW: Egypt (just 1 day), South Africa, Botswana, Zimbabwe (just 1 day), Namibia, Germany (just 1 day), Czech Republic, Poland, Slovakia, Hungary, Croatia, Slovenia, Bosnia Herzegovina, Montenegro, Albania, Greece, Turkey, Ireland, USA, Myanmar, Singapore, Indonesia (just Bali), Cambodia, Laos, Thailand, Vietnam, Hong Kong, Macau, and Nepal. This edition looks at our top 10 favorite ruined ancient cities. These are not in order from best to worst. They are just our top 10 favorite in the order in which we visited them. Butrint was the first large ruin we visited in Europe. This archaeological site has a fascinating history: it has been the location of Greek, Roman, Byzantine, Venetian and Ottoman settlements. Old structures from all of these are scattered throughout this small park located on a peninsula in a lagoon off the Straits of Corfu. 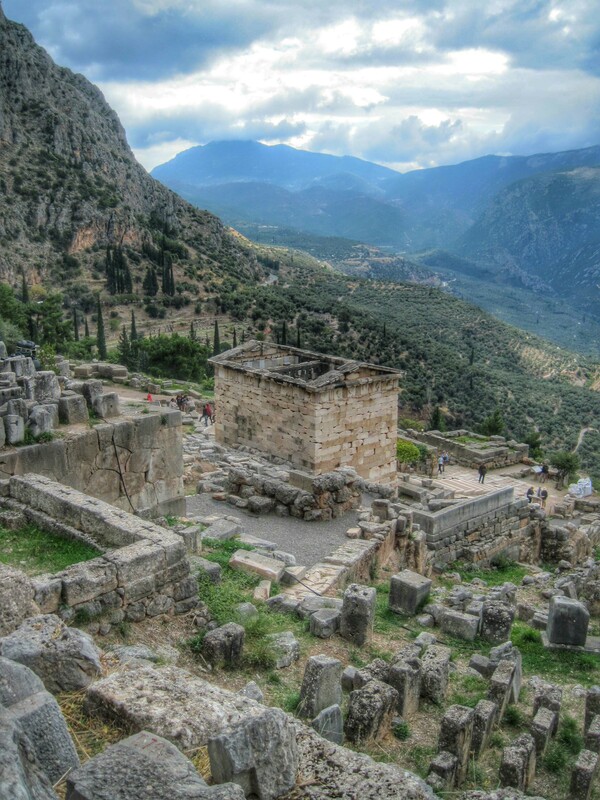 The ancient site of Delphi was a pilgrimage site located in the Peloponnese of Greece. 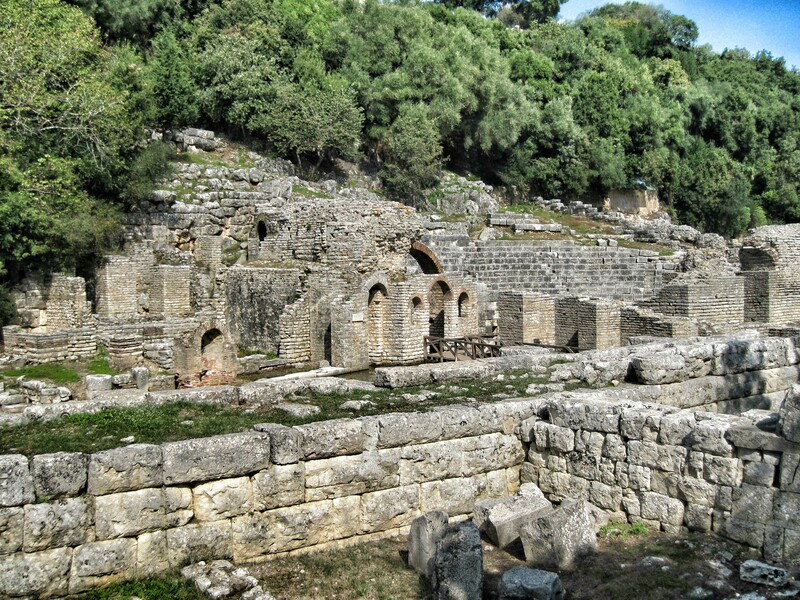 The biggest part of the site is the sanctuary of Apollo, the big destination for those coming to consult the Oracle. Delphi was an active site from at least the 8th century BC up until the 4th century AD (meaning even the Romans kept the site active). Since it was such a popular site, many of the different Greek city states built “treasuries” containing offerings to Apollo to thank the oracle for her advice. The most well-preserved of the treasuries is the Athenian Treasury, built by the Athenians to commemorate their victory at the Battle of Marathon. Olympia was the host site for the ancient Olympic Games from the 8th century BC all the way until the 2nd century AD. These ancient games were not just an athletic competition: they were also a chance for the Greeks to pay tribute to their Gods. Therefore, the site has quite the collection of ruins, both for athletic and sacred events. Mystras is the ruins of the medieval fortified Byzantine city located near Sparta. It is considered as one of the last remaining centers of Byzantine culture until the empire fell in the 15th century. It is located on a mountain with the ruins of the castle at the very top, with monasteries, the palace, and residences on the way down. The monasteries were both abandoned and active with some old but well-preserved frescoes that gave a glimpse into the Greek Orthodox culture as it existed during the late Byzantine period. Ephesus is on the western coast of Turkey. According to Lonely Planet, it is the most complete classical metropolis in Europe. It started around the tenth century BC and was once part of the Ionian League. It also served as the Roman capital of Asia Minor. Its Temple of Artemis was the biggest on earth and one of the Seven Wonders of the Ancient World. Unfortunately, all that is left of that Temple is one solitary, lonely, rebuilt column. The rest of the site is quite extensive and includes a large marble-paved sacred way, lined by different structures, such as temples, fountains, public baths and even a public lavatory. 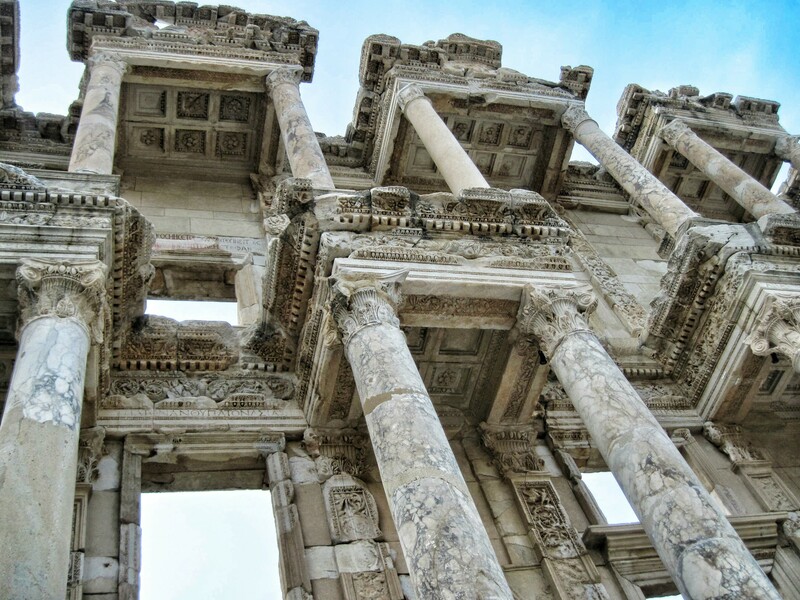 The most impressive piece of architecture is the restored facade of the Library of Celsus. 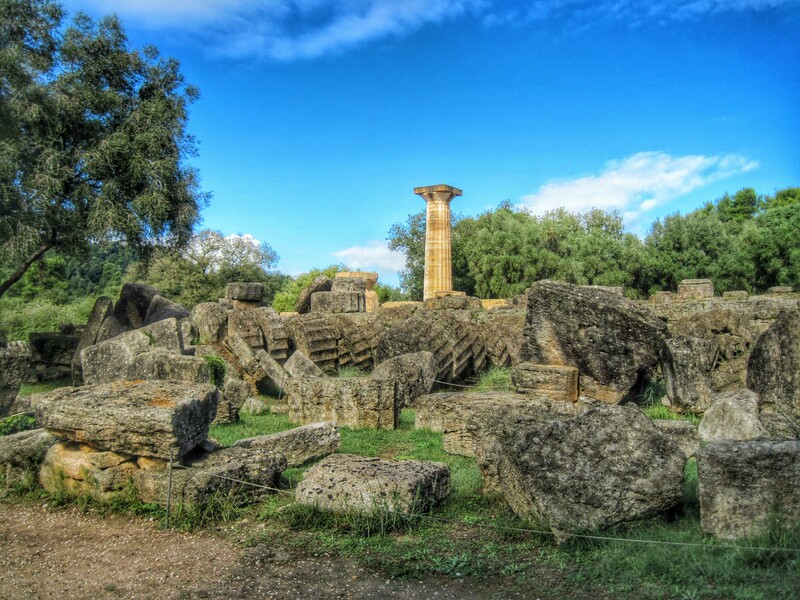 Tlos was one of the most important cities in ancient Lycia. It is a fascinating site because it has been pretty much continually occupied from the time of Lycia all the way up to the Ottoman Empire in the 19th century! 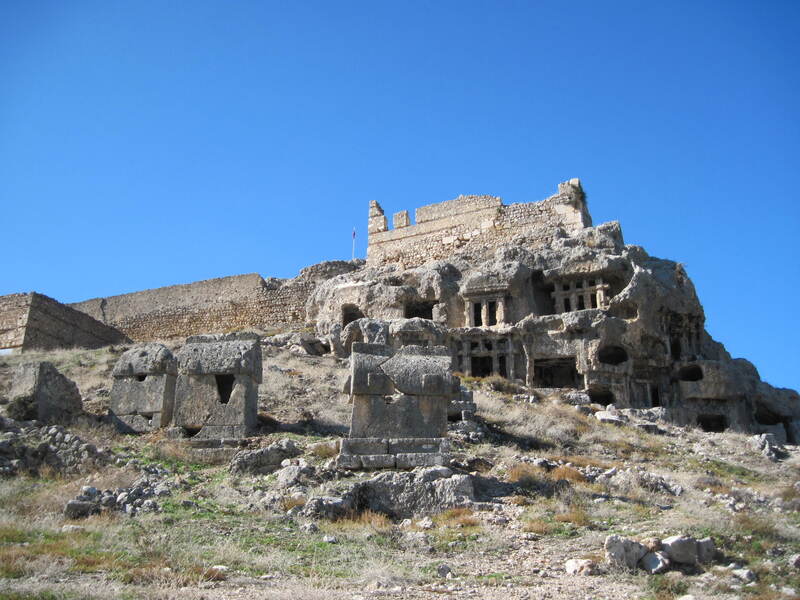 It has the distinctive rock tombs of Lycia, as well as an a Roman-era acropolis, theater, stadium, and baths. 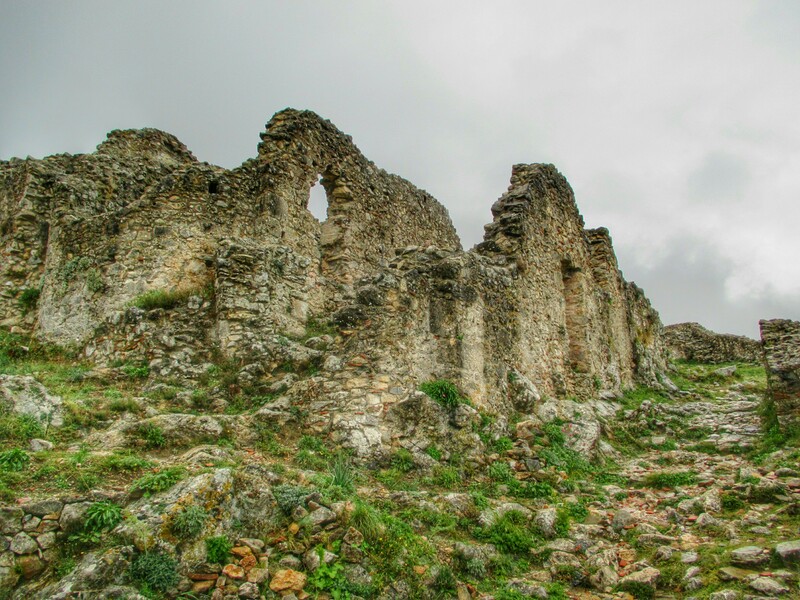 In addition there are Byzantine church ruins and an Ottoman-era fortress atop the peak. Another thing that makes Tlos impressive is its absolutely awesome setting, situated in the foothills of the Akdağlar mountain range. 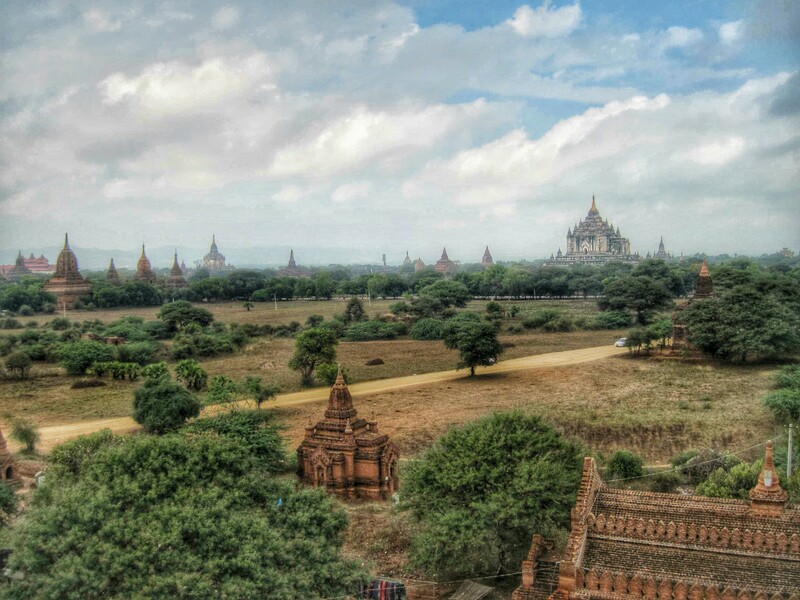 The area of Bagan is a large plain next to the Ayerawaddy River that is covered with over 3000 Buddist temples built from 11th to 13th century. After years of neglect, many of the temples have been restored and Bagan is one of the highlights of any itinerary in Myanmar. This site was the largest that we had seen thus far on the world trip. This was another site that was extremely large, stretching over some 400 square km. 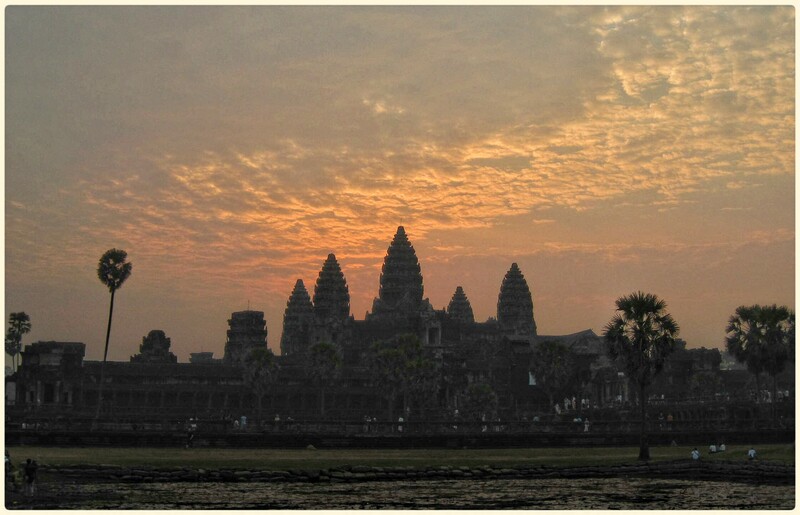 Angkor contains the magnificent remains of the different capitals of the Khmer Empire, from the 9th to the 15th century. The kings who ruled over the empire constructed large numbers of temples in the city as befitting of its status. They include the famous Temple of Angkor Wat and, at Angkor Thom, the Bayon Temple with its countless sculptural decorations, and many others. 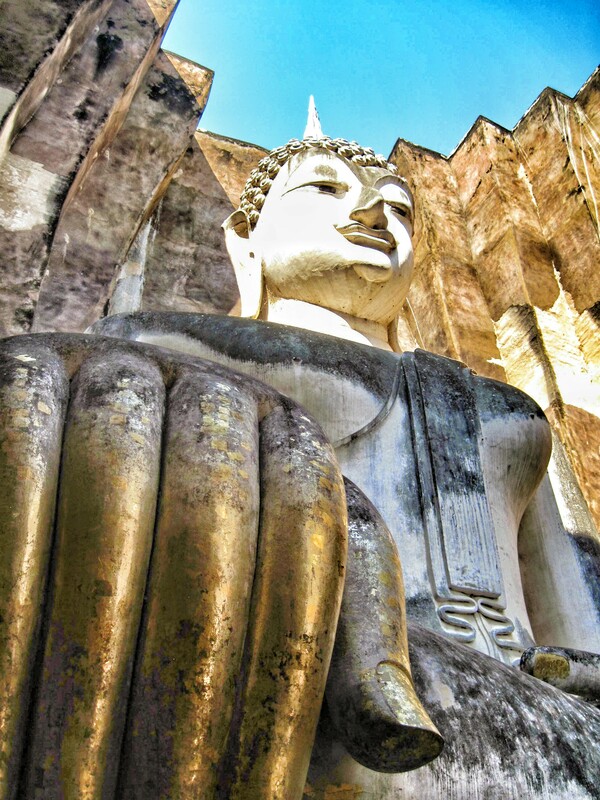 The Sukhothai kingdom came into prominence in the mid-13th century AD after the Khmer empire began to decline. It grew into a strong regional power and is known today for the unique artistic style that can be seen in the remaining temples. There are a large number of ruins to be seen which are spread out over a moderately-sized range. We particularly enjoyed Wat Si Chum, which contains an impressive large Buddha that is a great example of the Sukhothai style of art. The location of this image helps amplify its impact: at first you can only see the face, until you slip through a narrow passage and find yourself at the base of the immense seated figure. 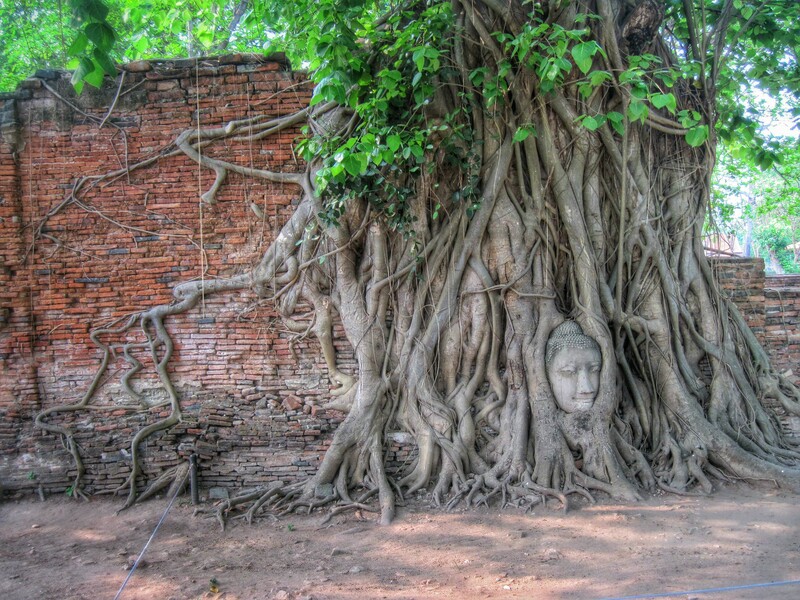 The kingdom of Ayutthaya, located on an island in the middle of a river about 50 miles north of present-day Bangkok, came into prominence a couple of centuries later than Sukhothai. It was the capital of the kingdom of Siam and the major trading port with the outside world. An invading Burmese army destroyed most of the city in 1767, but some restoration has been done. Our favorite part was a unique and curious sight: the head of a Buddha image wrapped up in the roots of a tree. No one is sure how this got here. Most people only head to Mae Sot, Thailand for a visa run from Thailand or as a border crossing into Myanmar, but we had different reasons for heading to this border town. Mae Sot is located near some of the larger refugee camps on the Myanmar/Burma and Thailand border. Because such a large percentage of Della’s students are refugees from this area, we thought we would come see if we could make some connections that would help her better serve that population back home. Originally (before we left home), Della had hoped to visit the camps herself. However, after a lot of unanswered emails, and research, it seemed unlikely. We had read that Mae Sot was a good place to meet NGO workers who might go in and out of the camps. We had hoped we could meet someone who worked in the camps who might be able to give Della a little bit more of an idea of what schooling for refugees might be like. Unfortunately, we didn’t really succeed in our goals. However, we still really enjoyed our time in Mae Sot. We found the excellent Pha Nu House in Lonely Planet and online. We booked via phone and were very happy with the place. It was a good location in town and the rooms were spacious, lovely, and had nice ensuite bathrooms. We really felt like we got a lot for our money. We had read a couple of blogs that mentioned hanging out with NGO workers at the “Canadian Bar” in town and at the Exppact Café. Unfortunately, when we arrived, we found out that the Exppact was closed. We had also heard about the BorderLine café and store which sold crafts made by refugees. After an afternoon arrival, our first stop was to head to the Borderline. We enjoyed perusing the crafts, books, and documentaries about the situation in Burma. We chatted with one of the workers, asking if they had any information about schooling for refugees. She indicated that her boss would be there the next day and that we might be able to talk to him. We agreed to come back at 1 pm the next day. Our next stop was the Krua Canadian restaurant in the main downtown area. This place is run by a Canadian immigrant and we had heard that it might be a good source for local information. We first started with drinks while we tried to decide if we would eat there. The wine was pretty cheap so we split a carafe with Peggy. The menu was a gigantic book, so we had a hard time deciding what to eat. We split a “Maesot” poutine for an appetizer and then for dinner we both got Mexican food since it had been a while! Eric got enchiladas and Della got a quesadilla. We eventually talked with the owner and while he didn’t know much about education, he was able to give some general information about the camps. One of the more interesting things he mentioned was that he thinks the camps will be shutting down by the end of the year. He mentioned that because some of the world leaders (including President Obama) have given a sort of “all clear” relating to the current situation in Burma, that the money for the NGO support and camps is drying up. He didn’t know what might happen to all of the current refugees. He also told us that Thai school was out for the semester and he believed that the camps probably followed a similar schedule, so we began to doubt whether we would necessarily find someone currently working at the camp schools. We headed home feeling slightly bummed that we hadn’t met anyone from the camps, but optimistic about our meeting at Borderline the next day. The following morning, we headed out and went to the local market, which we had heard was quite lively. And that turned out to be true! It felt like we were back in Myanmar – almost everyone seemed to be from there, with lots of thanaka face paint and plenty of Muslim people. There were all sorts of food, clothes, and other goods. It stretched on for multiple blocks. At one point, we were excited to find a stall that sold Burmese/English dictionaries and some posters with Burmese/English letters. Della bought some! We went through some large market buildings and also down some small side streets. Finally we reached a point where it felt like it was ending so we turned around and made our way back through. We took a slightly different route to get out and thought we had found a dead end until we saw a local squeeze through a narrow alley to get back to the street! Overall, this was one of the more exciting street markets we have ever been to! We then headed back to the Borderline. Unfortunately, the time we had been given was wrong and the boss had come by earlier that day so we missed him. We were bummed, but there wasn’t much we could do. Instead, Della struck up a conversation with one of the other workers who was, herself, a Karen refugee who had grown up in the camps. Della learned a bit more about the schools and the curriculum used, though not a lot that was hugely helpful. The most fun part of the encounter was when the woman agreed to help Della add to her new posters with Karen lettering. Now the posters have Burmese, Karen, and English. Della thinks her students back home will enjoy them! We bought a few souvenirs and then headed back to our hotel. 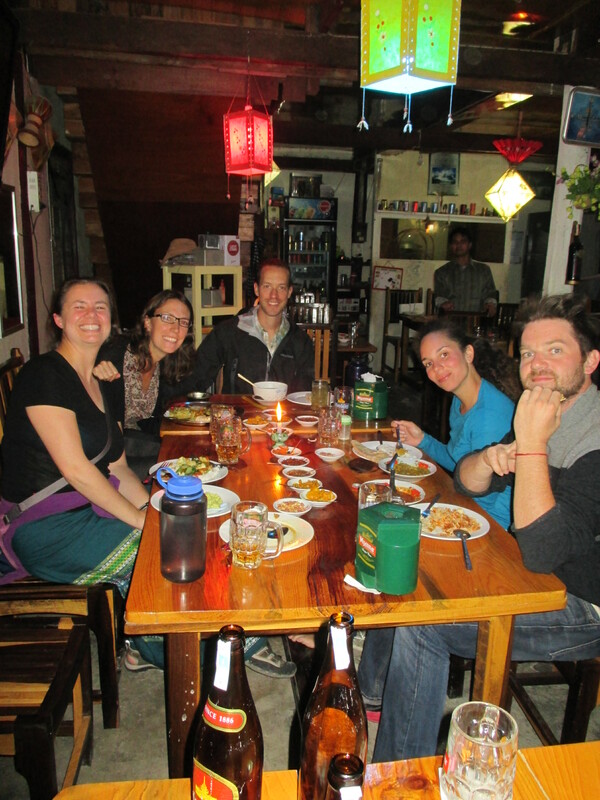 Our favorite meal was actually at the Borderline where they serve vegetarian Burmese food. For a drink Eric got Burmese iced tea with lime and Della got ginger juice. We shared a wide variety of dishes: ginger salad, pickled tea leaf salad, potato curry, fried noodles, Mandalay noodle salad and curried chickpeas. All were good. 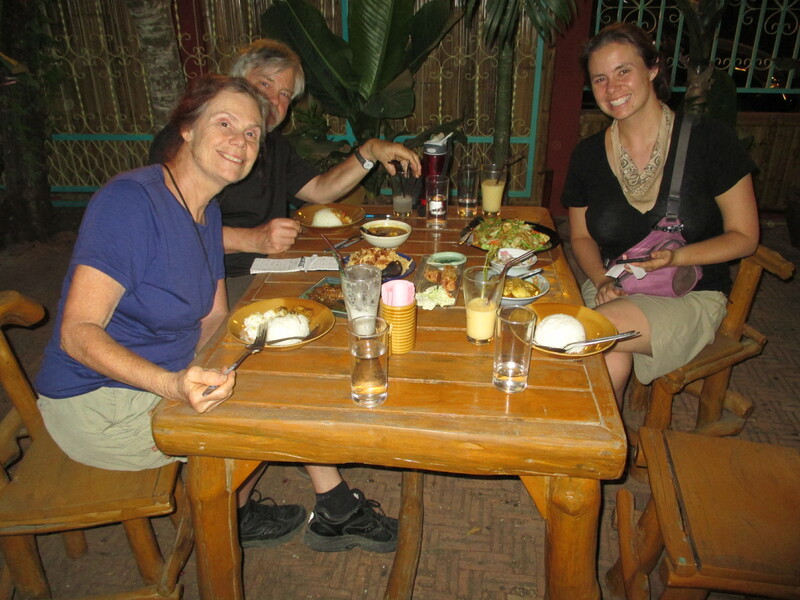 For dinner we decided to try another Burmese restaurant we had seen listed on TripAdvisor called Wadee. This was in the other direction and about a 15 minute walk away. The menu was much less interesting unfortunately. We got mango smoothies for drinks, then Eric got a chicken curry and Della got a big plate of fried noodles (she even had some leftover). We also enjoyed the Krua Canadian listed above for something a little bit different. We didn’t exactly meet our expectations of magically connecting with a teacher in the refugee camps, but we really ended up enjoying our travel there anyway. It was fun for us to relive, ever so briefly, our trip to Burma. We had a lovely place to stay, met a few nice people, and ate good food. The market was one for the most interesting we’ve ever encountered, so that was worth a lot. Enjoy our photos from Myanmar. You can also access our photos on the top right “places we’ve visited” menu. When we were researching for our visit to Myanmar, we had a few questions that we wanted the latest answers to. So, in case anyone researching for their own trip has these same questions, we thought we’d make sure our answers were available! How Did You Get Your Visas? We had originally planned to get them at the Myanmar Embassy in Bangkok during the few days we spent there before flying to Myanmar. However, we then heard about the new e-visa service being offered and decided that it might be simpler. We applied online while still in Denver, got a confirmation of payment within an hour, and then got our visas within three days, so it worked quite smoothly. The printed copy of the visa was accepted at the Mandalay airport without issues. From what we heard from other travelers, it would have been cheaper to get the visa in person in Bangkok ($20 vs $50 online), but it would also have taken up to 7 hours, so we think that was a good tradeoff. Were You Able to Use the ATMs in Myanmar? Yes! Although, we only ended up using them twice: once at the Mandalay Airport and once in downtown Mandalay at a bank. In both cases we used the ATMs from CB Bank. Both our Charles Schwab and Fidelity debit cards worked without issue. The ATM at the airport was a little scary though – it would randomly fail when giving the money. But we just tried again, and then it worked. The ATMs dispense only 5000s which is the equivalent of a $5 bill. You end up with a LARGE stack of cash! Do You Call The Country Myanmar or Burma? Back home in the US, we knew the country as Burma. But once we arrived in the country, it was clear that all of the locals we met referred to the country as Myanmar, so that is what we stuck with. We’re aware that there is a political angle to which name you choose to use, but we didn’t ever hear enough of a debate on that to take sides. No, not even the locals drink it. But every one of our accommodations actually had a freely available jug or bottles of spring water for their guests. Everywhere we stayed had at least some Internet connection. Some places it was surprisingly fast (Bagan) while others it was frustratingly slow (Inle Lake). But we were almost always able to get a small connection. 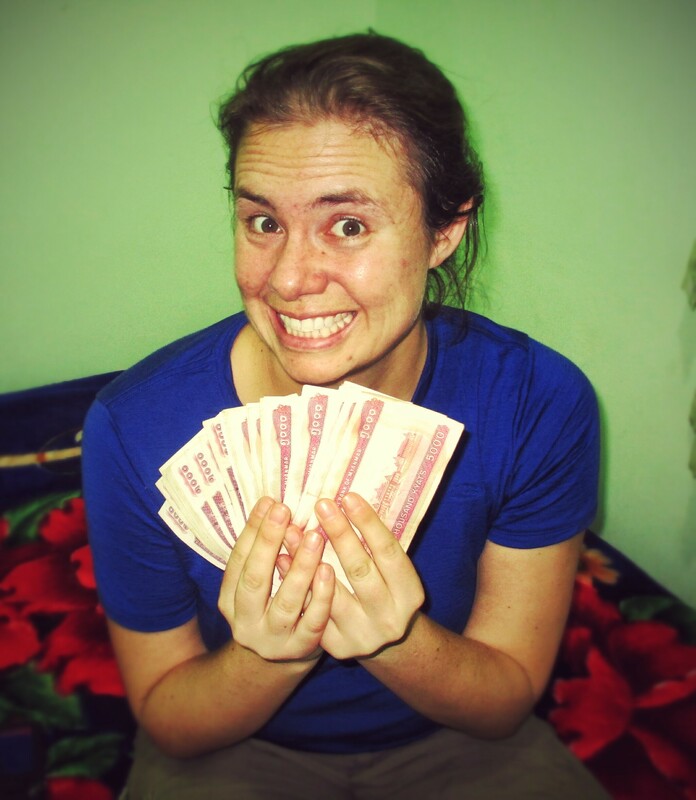 This is one of our Budget series of posts to give you an idea of how much we spent traveling around the world. Here we will look at Myanmar. Check our posts to see what kind of activities we did and where we stayed! 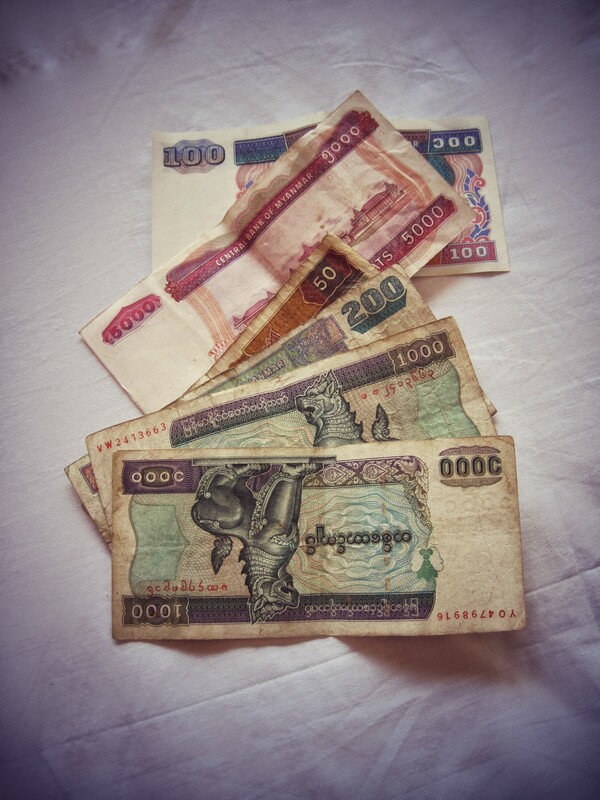 In Myanmar we used the kyat. We converted to US dollars using the current conversion rates at the time of our visit. It was approximately 1000 kyat to 1 dollars. Businesses used this as a flat rate, though the real rate at the time was more like 1,300 kyat to $1. 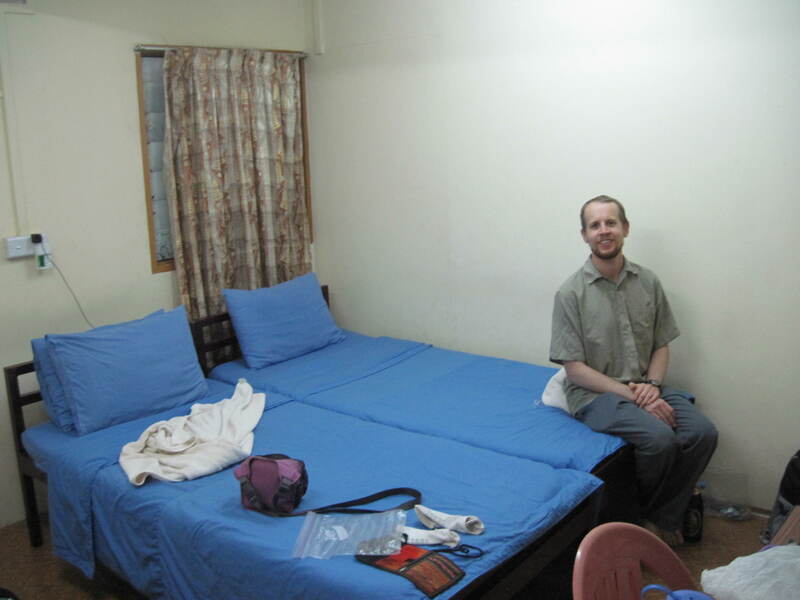 We stayed in a variety of accommodations: some hotels, some hostels, one dorm room. Everywhere we stayed included breakfast and drinkable water. Activities are quite affordable in Myanmar. We did several day tours, both in boats and cars. This included entrance and camera fees to all pagodas as well as a few museums. We also did a puppet show! Overall, beer is quite reasonably priced in Myanmar. You can normally get a large bottle of beer for under $2. We also visited a winery and had a couple of glasses of wine! 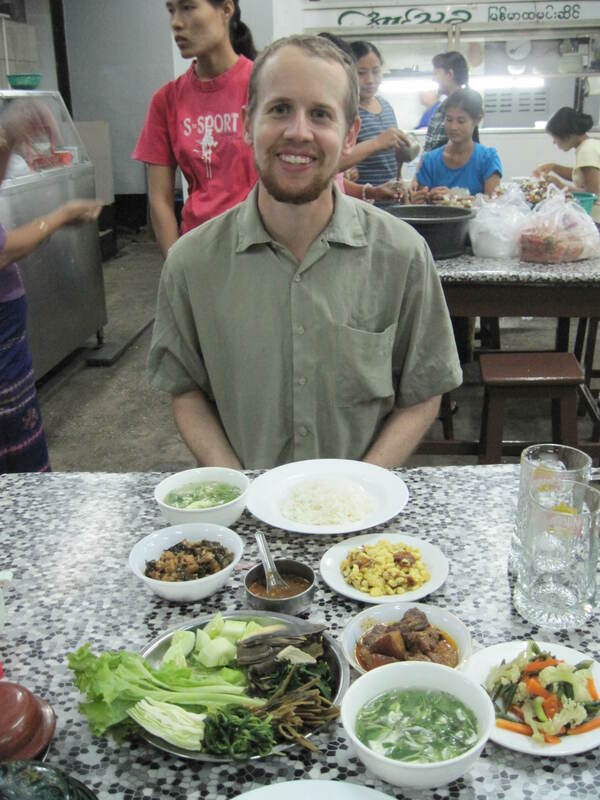 Food was wonderfully inexpensive in Myanmar. You could get a good meal with drink for under $10. You can also do it even cheaper if you are a little braver than we are: if you ate street food from stalls then it would be even more affordable. We didn’t as almost every person we met who had was sick. Though, we did hear of one friend recently who had no problems! This included a several souvenirs, several bathroom fees, a laundry, and a few exchange transactions. This included a variety of taxis and buses. The biggest cost was a boat ride from Mandalay to Bagan which was $80! We purchased visas online prior to arriving using the new online purchase tool for tourist visas. It was more expensive than it would have been in person in Bangkok, but a fraction of the time. This divides out to $72.48/day which is under our $100/day budget. It is not as low as we were hoping for time in Asia, though we knew Myanmar would not be the cheapest country in Asia due to the visa fees and the relatively high cost of accommodation. Our final stop on our trip through Myanmar was its largest city (and former capital), Yangon. We had initially only planned to spend a couple of our last days in the country in this city, using it as a base for a trip to the “Golden Rock,” but in the end we decided to just spend all of the time exploring the different things the city had to offer. 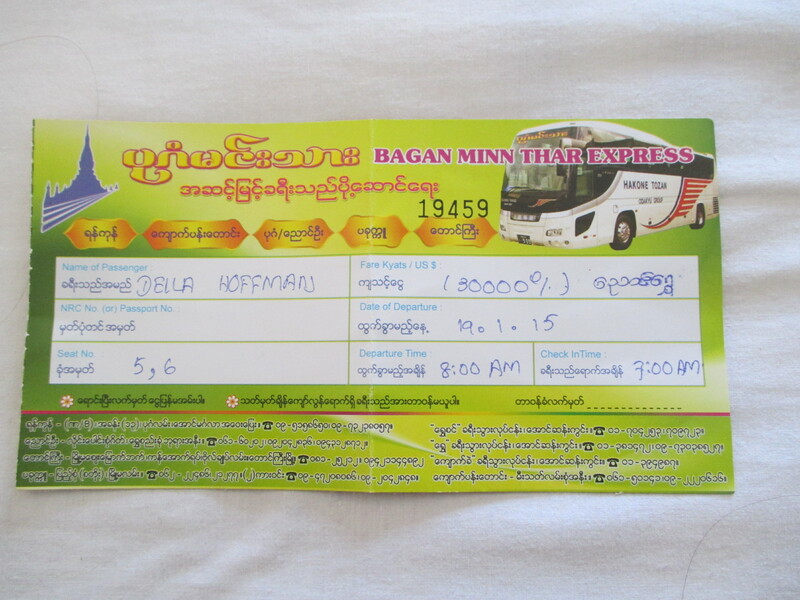 The main option to get to Yangon from Inle Lake was an overnight bus. We had to choose between the “normal” and “VIP” class buses, and we went with the VIP option with the hope that it would make sleeping easier. The seats were quite large, and had a good recline feature and a footrest. We also got a snack box and a toothbrush to use at one of the rest breaks. During the first part of the trip, they played music videos and one movie on the overhead tv, but for most of the journey the cabin was pretty dark and quiet. It really was quite comfortable, but even so, we didn’t actually end up getting too much sleep, so after checking into our accommodations in Yangon at 7 AM, we took a nice long nap. Finding a cheap but well-reviewed place in Yangon turned out to be quite a challenge, as there were many cheap places but almost all with average ratings. In the end we found the Hninn Si Budget Inn and ended up generally enjoying our stay. We had a small double room with a shared bathroom down the hall. 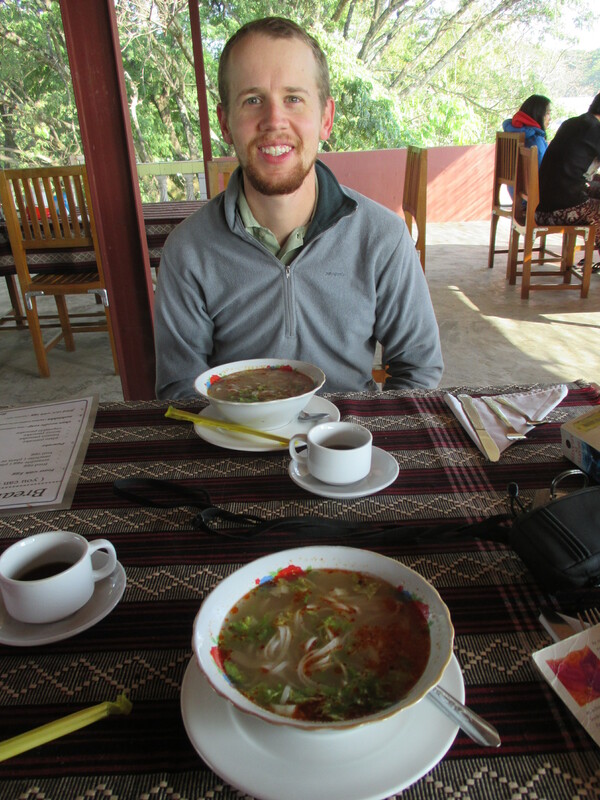 The rate included breakfast, although it was the least interesting of any breakfast we had in Myanmar. The staff was very kind and helped us with transportation a few times. Explore Downtown Yangon – The city has a lot of interesting sights to see in its downtown core, a lot of it left over from when the city was called Rangoon and functioned as the capital of the country during the colonial occupation by Britain. We ended up exploring this area twice: the first on our own using a self-guided walking tour in Lonely Planet, and the second time on a free walking tour led by Free Yangon Walks. The highlights included the Sule Paya – a large pagoda which now sits in the middle of a traffic circle, Mahabandoola Garden – a very pleasant park where we relaxed in the shade and made conversation with locals wanting to practice their English, and many examples of colonial-era buildings, from the City Hall to old banks to the fancy Strand Hotel. Even more interesting that the architecture was just observing life on the streets of this bustling city. There were food vendors of all sorts, and many people making new packs of the betel nut concotion that a good chunk of the population chews (the effect is supposedly similar to chewing tobacco). There were also vendors selling everything from SIM cards to clothes to even a large selection of used books, including many random English-language textbooks. We were also fascinated to observe the bus system: buses of all ages and conditions would go up and down the street, pausing briefly where a worker (usually a young male) would holler out the back (presumably announcing the destination) while pushing people off and pulling them on. We never worked up the nerve to get on one of these! 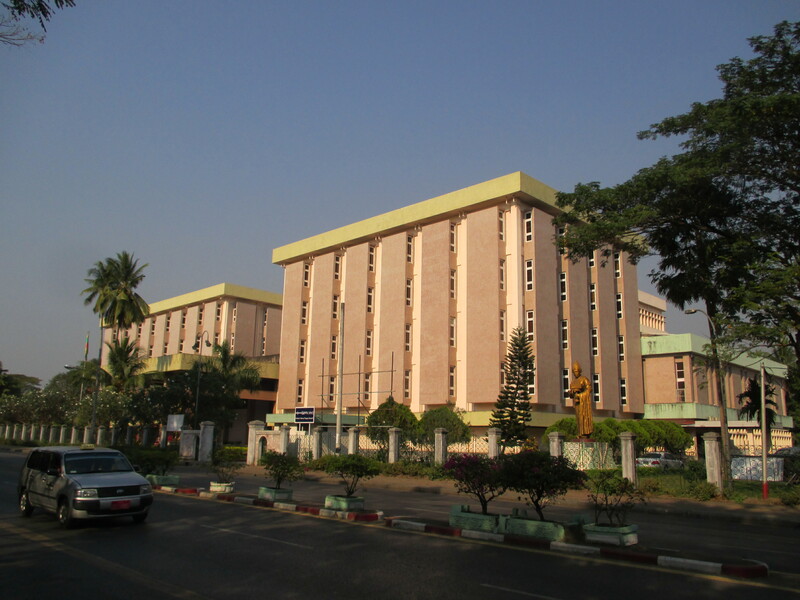 Ride the Yangon Circle Line – Yangon only has one commuter rail line: the Yangon Circle Line, which makes a slow loop around the city and its surrounding residential areas. Since it is a loop and costs so little ($0.50 per person), it has become a popular tourist activity. Some reviews made it sound pretty hectic, but we actually found the three-hour ride to be quite relaxing. Maybe it’s because we went on a weekend during the middle of the day; there was never too much of a crowd. We were quite interested to see life outside the train, including lively markets at some of the larger stops. Also, we enjoyed watching some of the people who hopped on the train midway through use the rest of the train ride to change their large collection of produce into sellable bundles. Shwedagon Paya – Many people consider this to be the most important Buddhist site in all of Myanmar. We planned our visit to have us arrive by sunset since the color was supposed to be the best then. The temple complex includes many smaller shrines, but the highlight is the massive central stupa. Unfortunately, a lot of it was covered in bamboo scaffolding during our visit (although you could argue that the scaffolding itself is interesting to look at). The entrance fee was the most expensive of any payas we visited in Myanmar, although we were happy that we got a detailed map with labeled narration for many of the smaller shrines. Botataung Paya – Much smaller than Shwedagon, but Lonely Planet recommended it, and it was just a few minutes’ walk from our guesthouse, so we checked it out. We went on a Sunday, so it was busy with worshipers coming and going. The most unique feature was that we could actually walk inside the large stupa – in all other cases this was closed to the public. This one had a maze-like interior with walls gilded with gold and a few different relics, including a few hairs of Buddha that we had to get in a line to see. National Museum – We spent an afternoon exploring this large museum dedicated to Myanmar’s history and culture. There were many different exhibits scattered over the five floors, including displays on royal artifacts, fossils, traditional arts and crafts and the different cultures within the Myanmar. We felt the most interesting exhibit was the Lion Throne, one of the eight such thrones used by the king for ceremonial purposes (which looks more like a door). We weren’t even allowed to take cameras into the museum, so we don’t have any pictures of the interior. Kandawgyi Lake – We spent an afternoon in this park just to the east of Shwedagon Paya. The boardwalk on the southern edge provided scenic views, but some of the boards could have used some serious repair! It was pretty hot and sunny, so we followed the lead of the young local couples we saw and found a spot in the shade to relax and enjoy the view. People’s Park – This was one of our highlights in the latest monthly update! The most interesting places to eat would have been the different street food stalls all over the place, but we had met enough fellow travelers who reported getting food poisoning that we decided to stick to restaurants. In doing this, we discovered that in most cases, especially near our guesthouse, the restaurants were more expensive in Yangon than they were in other parts of the country. At the Malaysian place across the street we both just got fried rice since everything else was twice what we had been paying for entrees elsewhere, and then at a Chinese/Shan place down the street Eric was downright shocked when the bill came and his dish was $7 (we had been paying in the neighborhood of $2-$3 in other places). 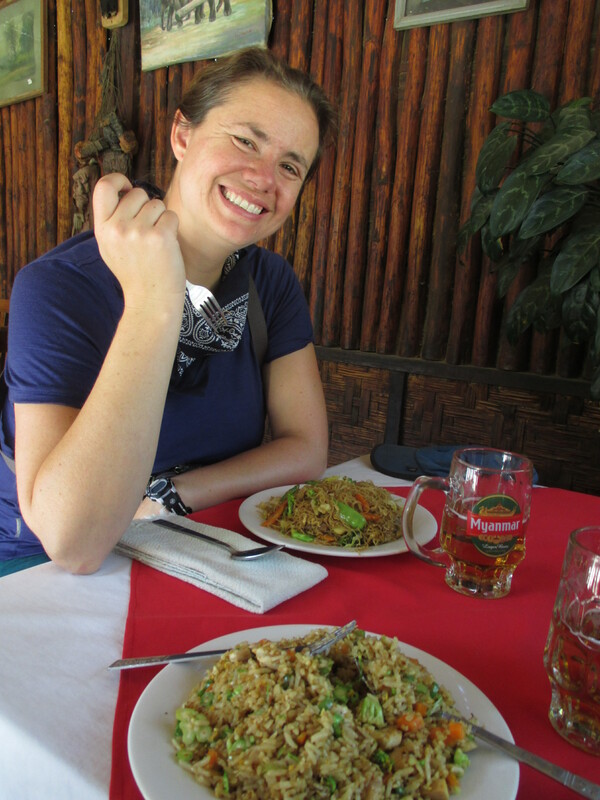 We did find some nice cheap restaurants elsewhere in the city with the help of Lonely Planet. The first was Aung Thukha near the Shwedagon Paya. This was one of the standard curry places where you chose a main meat and got to enjoy it with a soup, rice, and vegetable side dishes. Della got a pork curry and Eric went with catfish. Near the National Museum we ate at Feel Restaurant. The menu was quite overwhelming, with 20 pages of choices, and none of the descriptions in English. We both pointed at pictures that looked good and hoped for the best. Della ended up with a noodle dish and Eric ended up with a soup with the consistency of egg drop soup with a meat that tasted like chicken. We crossed our fingers as the bill came, and were very pleasantly surprised that each dish was only $2! We think it was the right decision to spend our last five days all in Yangon. There were plenty of things to do, and we enjoyed getting to explore the city at a leisurely pace instead of rushing between sights. The city was also a great way to get a good last glimpse of the people and culture of Myanmar. As we flew out of Yangon, we were a little sad to say goodbye!